I volunteer one week a year at Yosemite Bible Camp in Oakhurst, CA. The Holey Boards (aka washers) I built about 10 years ago finally gave up the ghost. 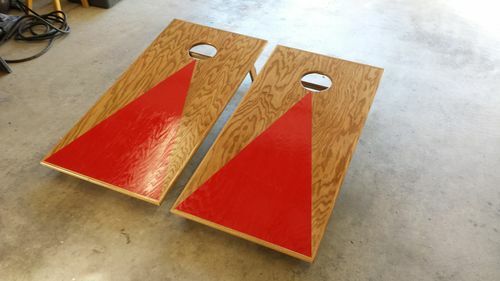 I decided that I wanted to make a set of Corn-Hole boards. Much safer than flinging 5” washers around. They needed to be pretty tough to handle the abuse that 4th thru 12 grade kids (and some adults too) could throw at them. 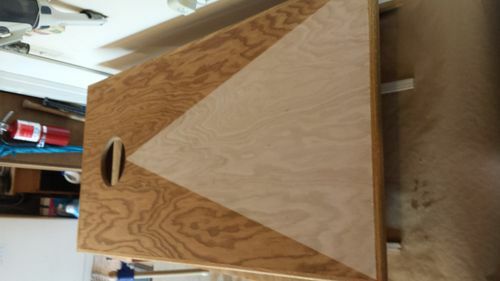 The boards are built from 3/4” Purebond plywood from HD. They are wrapped in red oak to protect their edges. The frame boards are also 3/4” PB plywood. 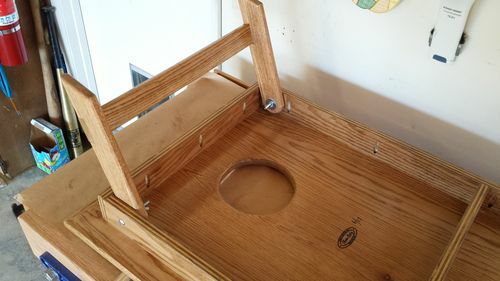 I used pocket holes and glue to assemble the frame. The legs are 3/4” red oak. I used a 6” hole saw to cut the circles. 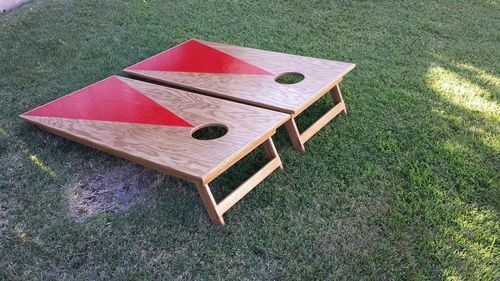 It was made specifically for making Corn-Hole boards. I would just use a jig saw if I build another set. I taped off the area I did not want stained and then applied Minwax Golden Oak stain. I had planned to leave the triangle area blond if the stain didn’t seep under the tape. It did. After the stain dried I taped off the stained area and laid down 3 coats of Red Spray Paint. After the paint dried I brushed on 3 coats of water based Poly top and bottom. All that’s needed is a coat of wax and it will be ready for the kiddo’s. LOL, yeah. Every time I hear corn hole boards, I’m thinking they are intended for a Terry Southern book fest. The boards look great though. Nice work. It turned out very nice looking. I think I would have varnished the entire surface and the come back with the red color after the varnish thoroughly cured. Yep, That’s what I would do if I was doing it again. I was really hoping to keep the un-stained area unstained. and then just clear coat all of it but there was enough bleed through under the tape that I couldn’t live with so I went to plan “B”.